B favored her left hand as an infant, but she would use her right if she had to. So we decided not to encourage her either way. We didn’t put crayons in her hand, for instance. We always let her pick them up. Same with forks and spoons…we just let her natural preference emerge over time. So Karen suggested these tracer sheets which you can find and customize online. 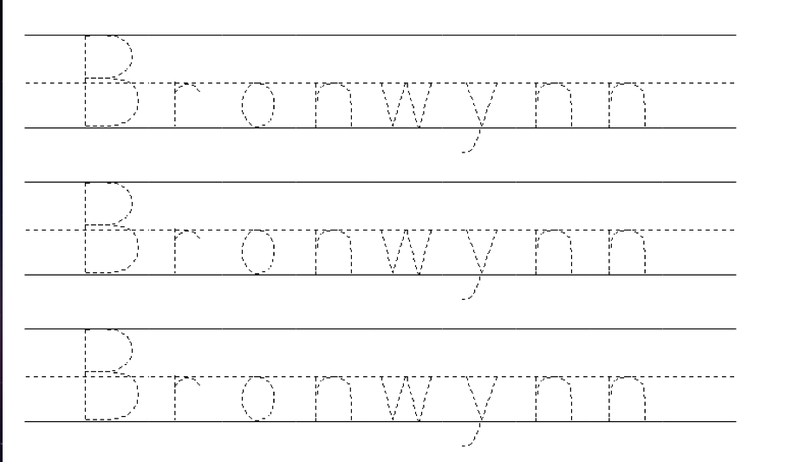 (Just Google “tracer sheets” or “handwriting sheets” and you’ll see several sites offer them) You can also print alphabet sheets and block or cursive letters to practice. If you’re left handed, please leave a comment with a tip for us right-handed parents. How can we make things easier for B? Matthew took forever to show any hand dominance — kept using both hands up until about age 5. But until then, I bought two pairs of scissors for him to use — a left-hand pair and a right-hand pair. It definitely helped with cutting when he was using his left hand. Thanks for the tips! My little guy is almost 3 and has always favored his left hand, although uses his right quite well sometimes also. I think he’ll end up a lefty but we’re also just letting him choose for himself. My dad was one of those kids who was forced to switch from left to right in school. He had HORRIBLE handwriting which I think might be a direct result! So glad they don’t do that any more! As a lefty, my hand always dragged through my writing. Pencil always smeared on my hand [oh the hardship]! I don’t know how to fix that problem (pen did the same thing), but man it used to bug me. I appreciated left-handed scissors and notebooks that had small spirals. Big, three ring binders always made it difficult to write because I had to squeeze my hand in between those big rings and the little column to start writing. No fun. As a lefty parent of righty kids, i know it can be confusing. As far as the hardships of being a lefty, make sure she doesn’t have a righty desk (the vintage kind that come around from the right of the seat), writing from left to right doesn’t come naturally for us, so be patient, and left handed scissors are SO helpful. As far as being a parent of an opposite hander, have someone else teach her to tie her shoes!!! 🙂 Love y’all! My son is left handed and I find it is easier to sit across from him (my right holding his left) to help him trace/write. Dear Gina, Just so you know there are stores of left handed stuff. My MIL was a lefty. Her Dad was one of the few who refused to force her to switch, as I understand he had to stand strong against a lot of others. One thing to be aware of and it’s a while off yet, is that Mothers who are left handed often have children who are dyslectic. Just so you know. Also you should be aware that in many parts of the world it’s considered a bad thing. One reason is that in cultures such as Arabia where people eat from a communal dish the left hand is used for cleaning yourself when you go to the bathroom. In a land where water was scarce, no one wants you using the same hand in everyone’s meal. I would prepare her for that before she encounters it. If for example you travel abroad. Help her to know that some people may not understand, but you love her just as she is.